Last October, our tagging program was featured in an ABC World News segment (“A Nation on Monarch Watch“). 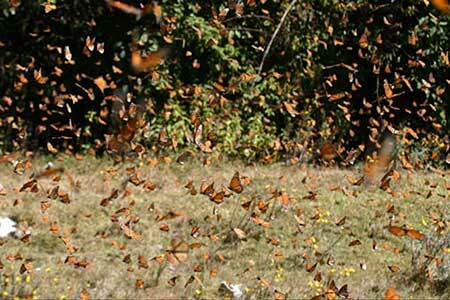 This segment utilized some of my footage (shot in March, 2007) of streaming monarchs at Cerro Pelon in central Mexico. To stand in the “river” of tens of thousands of monarchs as they race down the ravines from the colony at Cerro Pelon on their daily quest for water is one of the most amazing natural phenomena I’ve ever had the privilege to experience. 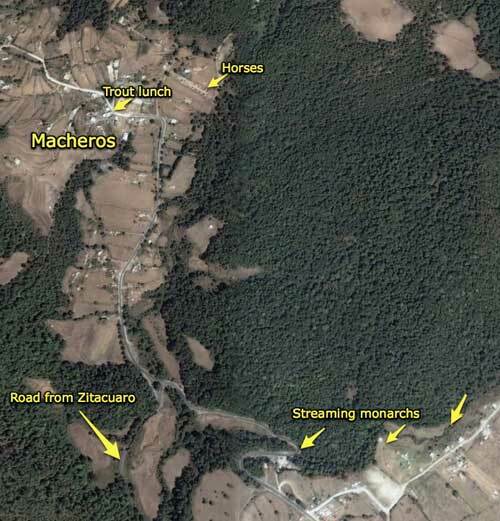 Monarchs “streaming” at Cerro Pelon. Photo by Chip Taylor. Movement of monarchs from the colonies to sources of moisture occurs on most warm days during the overwintering period from November through late March. Relative to the total population, the proportion of monarchs engaged in this activity is modest until mid February when the search for water intensifies. From that point onward monarchs “streaming” down from the colonies to moisture sources becomes a common sight. At Cerro Pelon, the butterflies, in what I call the “Monarch River,” are so abundant that you can hear the light clatter of the wings as they rush past at 10-12 miles per hour. If you are standing in the right place (or the wrong one from the butterflies’ point of view) they bump into you frequently as they are going so fast that they can’t always avoid obstructions. The “streaming” starts at 9am on warm clear days, lasting until early afternoon. Once the butterflies have acquired the water they’ve sought, they begin to “stream” uphill at a more leisurely pace, usually taking a different route back to the colonies. The quest for water is frenetic and energetically demanding and seems to take priority over visiting flowers for a source of moisture. The streaming precedes the migration northward and it could help prepare the monarchs for the return migration. Although streaming can last for weeks, it is not clear how long individual butterflies participate in the daily traverses down and back up the mountain. 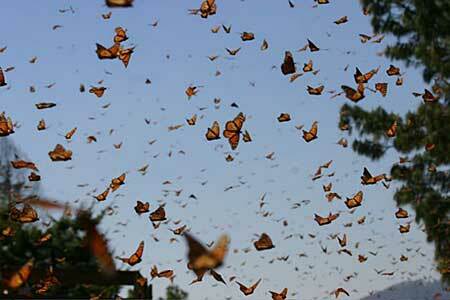 Video: Monarchs “streaming” at Cerro Pelon, 2007; 30 seconds. Streaming could serve several functions. The overwintering butterflies are in reproductive diapause and have a low metabolism. This low metabolic rate is under hormonal control, a control that is broken when ambient temperatures increase causing the butterflies to become sexually active. The water seeking activity, with its rapid flight, certainly raises body temperature and could accelerate this process by activating the hormonal cascade that breaks diapause. Further, the water acquired is probably used to metabolize lipids into sugars for flight and to facilitate the development of the latent reproductive organs. At the time these changes are occurring, environmental information is acquired and processed by the monarchs – in a manner as yet unknown. It may be that a genetic cascade is initiated that up-regulates the expression of some genes while down-regulating other genes with the overall effect that the butterflies reacquire the behaviors, five months dormant, needed to migrate northward to reproduce and start the annual cycle once again. We have a lot to learn about this process. How do the monarchs find water? We don’t really know, but if monarchs are like other insects whose water seeking has been studied, they probably have special receptors for water known as hygroreceptors. Whatever they use, it certainly works. On a Sunday in March near Macheros, the village that leads to Cerro Pelon monarch colony, while filming streaming and water seeking monarchs I noticed a man watering his front “lawn” (mostly dirt with a sparse head of grass). He watered for quite some time and, as each portion of the front yard was watered, monarchs began to settle. By the time he finished watering there were thousands of monarchs in the front yard. Shortly thereafter the first guests arrived for an afternoon party. As each guest walked across the yard to the front door hundreds and hundreds of monarchs took flight around them. It was a delightful sight and I’m sure the rising monarchs were the host’s gifts to his guests and that the water was an intentional gift to the monarchs. Monarchs watering on moist grass. Photo by Chip Taylor. 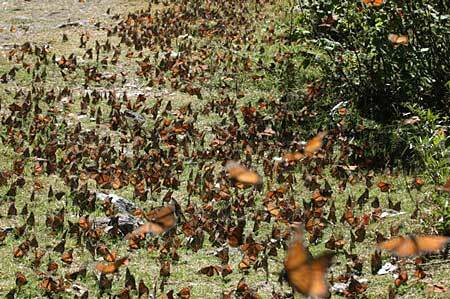 Monarchs “streaming” down a ravine at Cerro Pelon. Photo by Chip Taylor. Thanks for all you to do to help ensure any measure of protection for this natural wonder, and for inspiring other “citizen scientists” to help as well. I wonder if anyone has ever analyzed the water in that area to see what minerals, etc. it contains. Perhaps the water in Mexico is more than just plain water. Thanks for this. It rekindles so many wonderful memories (which words fail to capture) of our trip to El Rosario 4 years ago. We could feel our hearts racing in anticpation as we drove up the mountain with Carole Jordan, hardly believing that we were about to actually experience something akin to the scene you describe. Then, after a lengthy climb, came the tears and joy, as we stood in the ‘stream’, in awe of the ancient majesty surrounding us. Hopefully, because of the efforts of Monarch Watch and many passionate people across three nations, our grandchildren will be enabled to retrace our steps and relive our experience in their generation, and for many generations to come. Seeing such and amazing and breathtaking sight is just what I needed tonight! Chip, thanks. I was there last year with my 9 year old daughter and it was indeed magical and breathtaking. I am thinking of returning with my 6 year old this year. What a spectacular video!! It’s the dead of winter and now I’m really getting Spring fever. 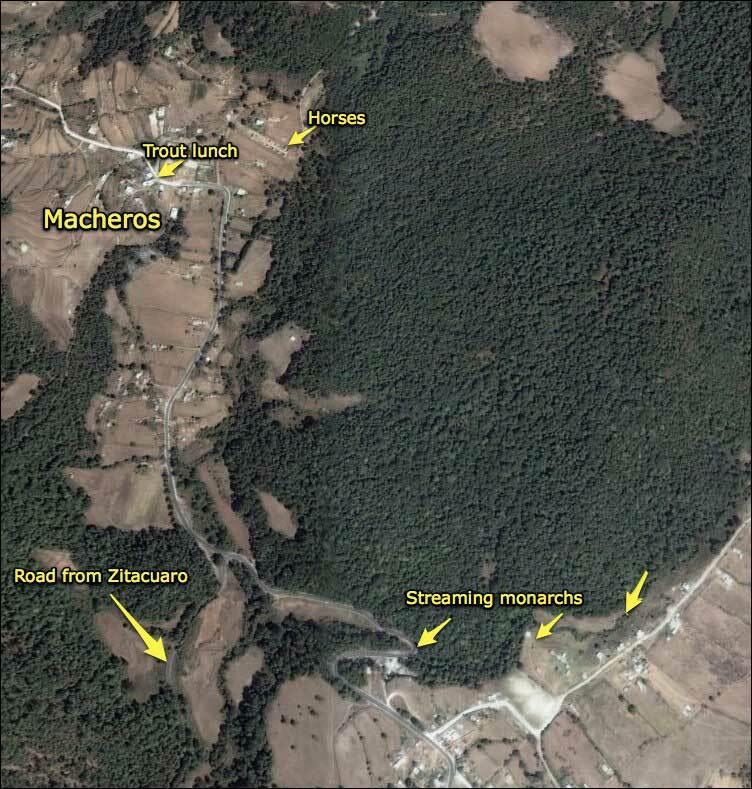 When I had the great opportunity to go to El Rosario in 1999 to see the monarchs they stayed mostly in and on the trees. I’m hoping that I get another chance to go back and see so many flying. Maybe stay in Angangueo when the monarchs begin their journey back. The whole village is a party from what I understand!! Thanks so much for this chance to see what other monarch lovers think. I am going to Angangeuo end of February for 10 days to see all that you have described. I am soooo excited. Thanks so much to taking such good of those beautiful monarchs.